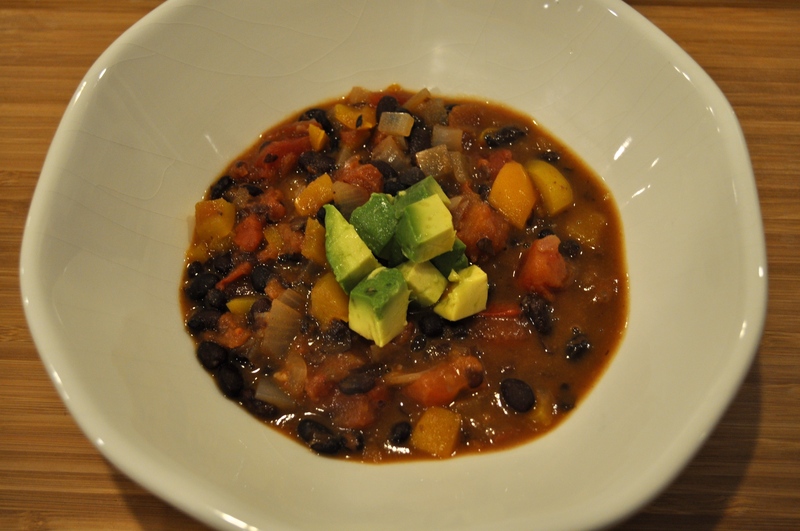 Yellow Pepper, Black Bean, and Cumin Chili – Got Nourishment? This is definitely my favorite vegetarian chili. It’s super easy to make, only takes about 1 hour total (including cook time), and is delicious! Adjust the spice to your preference. If you are serving people with different spice needs, I suggest putting out a small dish of minced canned chilies for those who want to mix in a little extra spice! Another great part of this recipe is the addition of 2 cups of blended chili. This adds thickness and a lovely texture to this bean chili. Pair with some whole-wheat cornbread muffins and you have a well rounded and satisfying meal! At only 300 calories per one cup serving, you can’t beat this meatless chili! Bon appetit! Top with avocado, light sour cream, or a dollop of plain Greek yogurt! Heat oil in heavy large pot over medium-high heat. Add onion and bell pepper. 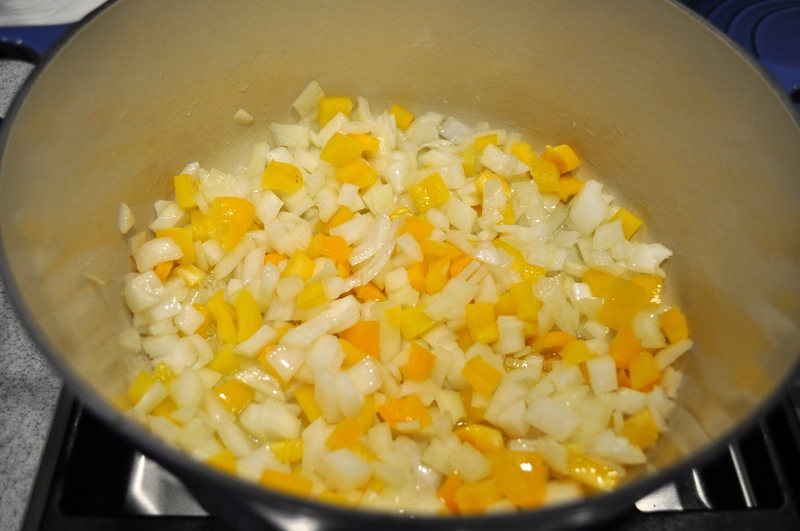 Saute until onion is soft and golden, stirring frequently, about 10 minutes. Add garlic and ground cumin and stir 1 minute. Add chipotle chilies and stir 30 seconds. 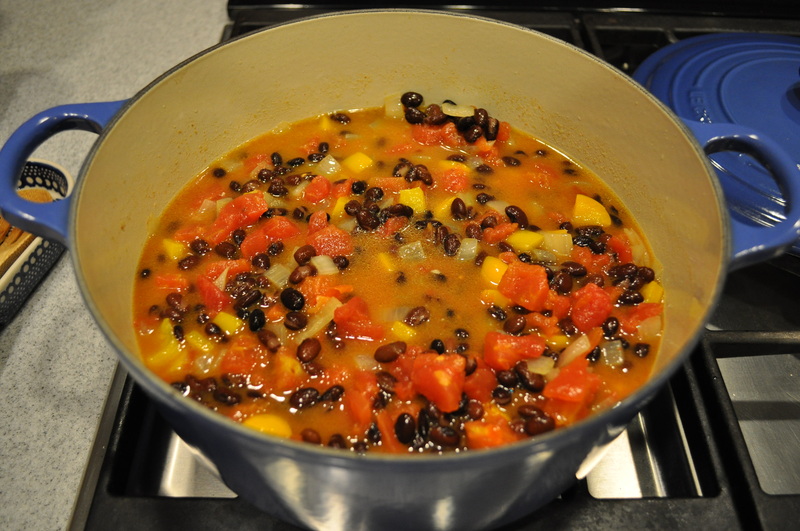 Add black beans, diced tomatoes with juices, and vegetable broth. Bring to a boil. Reduce heat to medium. Simmer uncovered until liquid is reduced by half, stirring occasionally, about 30 minutes. Transfer 2 cups chili to food processor or blender. Blend to coarse paste and return to pot. Simmer chili to thicken, if desired. Season chili to taste with salt and pepper.